Ikats from “To Dye For” at the Sackler Gallery in Washington D.C. The next time you hit Crate and Barrel, or Target, take note of the ikat designs everywhere. 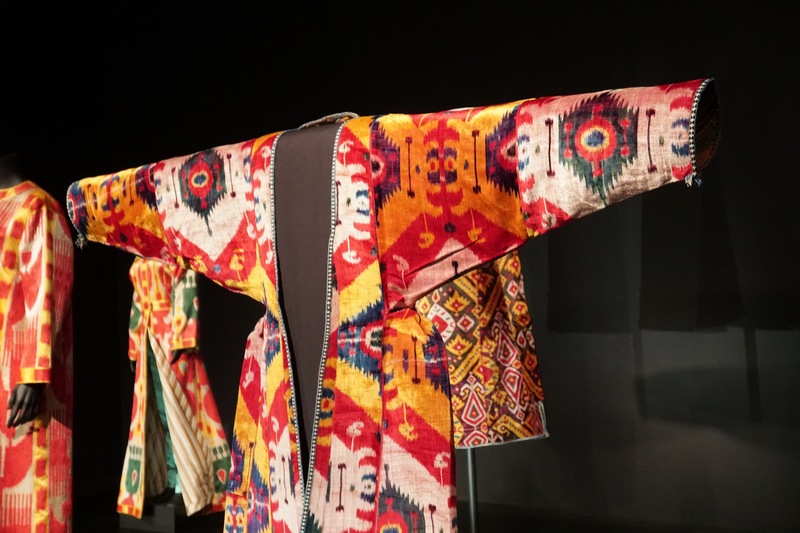 If you don’t know what ikats are, go down to Washington’s Arthur M. Sackler Gallery of Art for the new exhibit, “To Dye For: Ikats from Central Asia.” It displays antique robes alongside the work of a Western fashion designer who discovered and popularized the design – Oscar de la Renta. The Sackler Gallery had an ikat exhibition in 1998 drawn from the collection of Dr. Guido Goldman. Later he donated 70 textiles to the museum. The museum has drawn from the donation for this exhibit. Farad said that tiny fragments of ikats have been found as early as the 8th century from Yemen but they really flourished in Central Asia from the early 19th century. The ancient “Silk Road” cities of Bukhara and Samarqand became hubs of the textile industry. After Uzbekistan’s independence in the 1990s, there has been a revival of ikat production. The process of making an ikat is laborious. The designs, with pomegranates, jugs and others, are created long before the actual weaving is begun. The threads are dyed from light to dark, usually starting from yellow to the red to indigo. 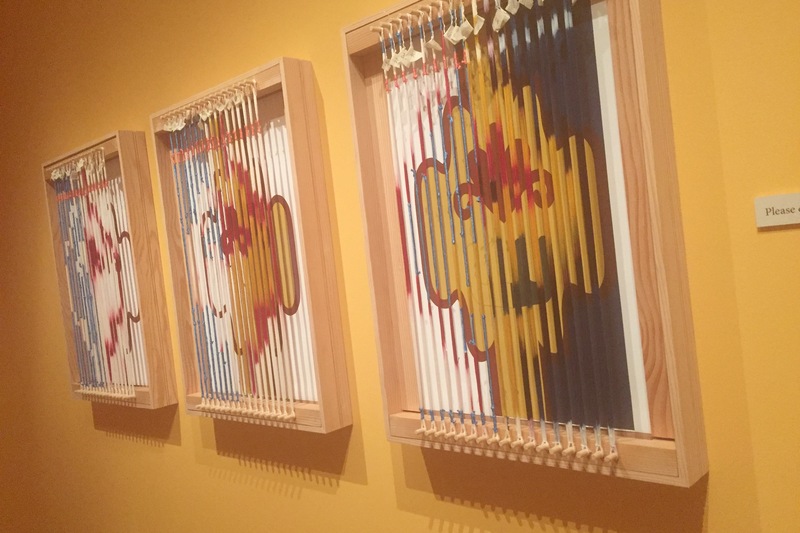 At George Washington’s The Textile Museum, which also has a ikat exhibit, “Binding the Clouds: the Art of Central Asian Ikat,” The Maryland Institute College of Art, Baltimore, has constructed several examples of looms strung with dyed yarn which shows the complications of the weaving. At the Sackler, Farad explained that the dying and weaving were done by different guilds. The indigo was done by the Jewish community; the Uzbeks “would be weaving the pieces together.” The hangings were used to separate spaces in a house or to cover things like blankets. When you look at a large hanging, it is easy to find the seams where the shorter ikats were sewn together to make a large one. When they wore out, then fragments could be used as patching materials. In the late 1990s, Dominican-American designer Oscar de la Renta went to Uzbekistan and was “stunned by the colors and designs,” said Farad. He introduced ikat designs into his clothing in the late 1990s and up to 2013. 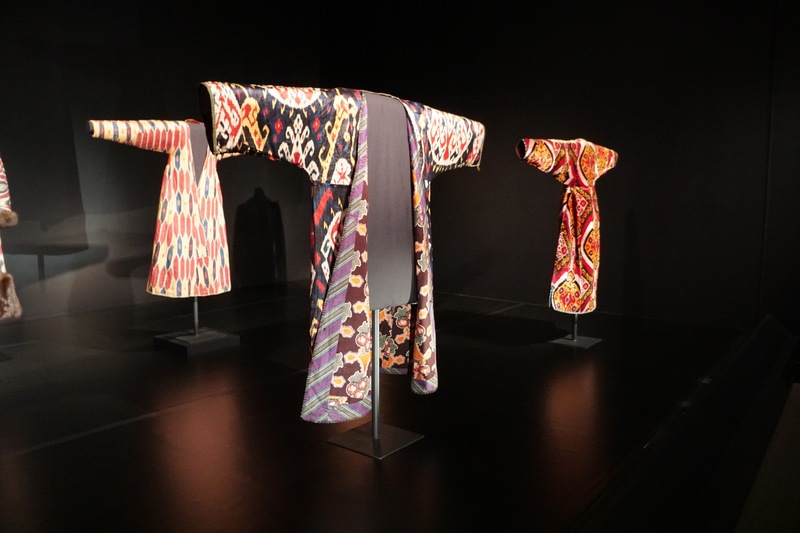 A dress and several of de la Renta’s ikat-patterned coats are on display alongside with the antique ikats. Fall 2013 Oscar de la Renta dress made from silk and wool jacquard using ikat designs. On April 14, the Textile Museum is holding a “Shop Event: Ikat by the Yard” offering three new custom-designed and handmade velvet ikats from Uzbekistan. “To Dye For” runs until July 29, 2018 at the Arthur M. Sackler Gallery in Washington D.C.
“Binding the Clouds: The Art of Central Asian Ikat” at The Textile Museum runs through July 9, 2018. 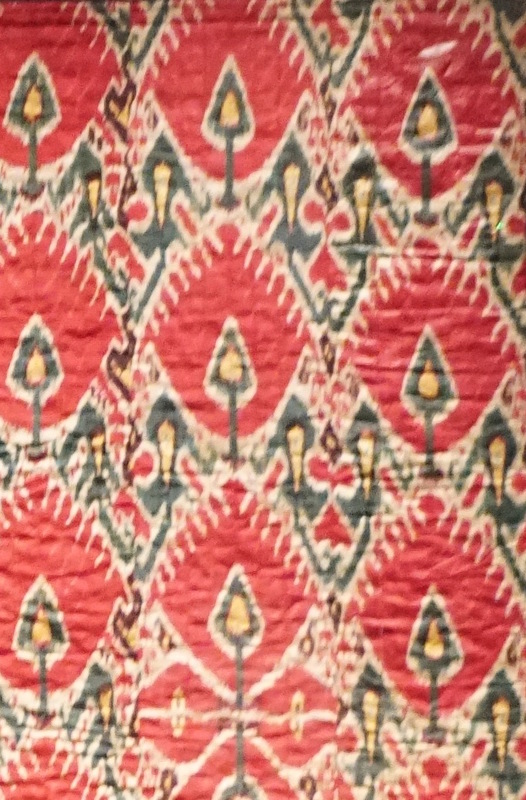 This entry was posted in 2018, History, Sackler Museum and tagged Central Asia, ikat, Sacker Museum, Textiles, Uzbekistan. Bookmark the permalink.